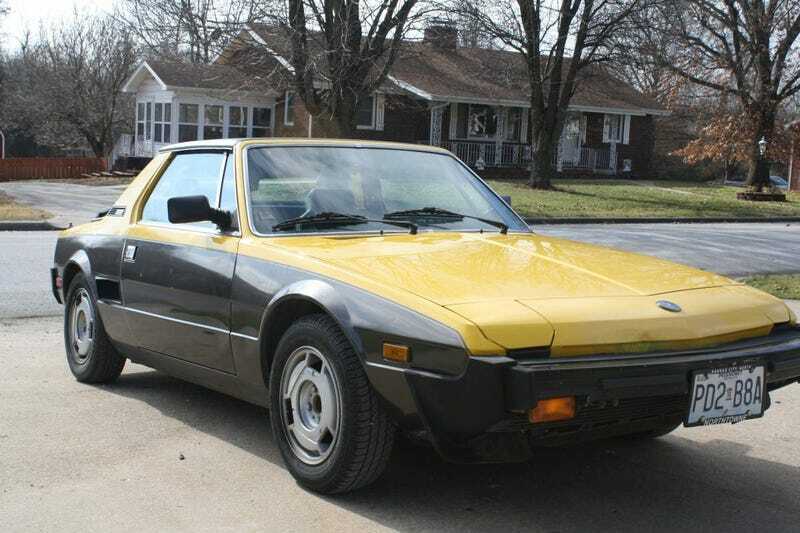 For $3,500, Could This 1984 Fiat/Bertone X1/9 Win The Whole Shootin’ Match? The seller of today’s Nice Price or Crack Pipe two-tone Bertone says he’ll take cash for the car, or a trade of light armament. We don’t do guns for butter here, so we’ll have to see if his cash offer is a-okay, or if he’s just shooting his mouth off. Man, trying to get you all to drop a positive vote on yesterday’s 1989 BMW 325IX Touring was like trying to get your best friend to date your significant other’s best friend. Oh wow, I’d really like too, it’s sooooo nice, but you see I just can’t. The just can’ts won the day, and that rare, desirable, and not destined to be mine Bimmer fell in a shocking 60% Crack Pipe loss. Somewhere, an angel lost its wings. Oh well, let’s talk about firearms for a minute, okay? I want a gun with a cool name like that. Better yet, I want a cool Italian car. Micheal Corleone had an Alfa 6C in the movie version, but that didn’t turn out so well for either him or his wife, so maybe I’ll stick with this cool 1984 Fiat/Bertone X1/9. I’m sure you’re all well versed in the history of the X1/9—the fact that it used the 128’s FWD drivetrain in the back; the origin of its name being the development studio and model; and that they were never considered to be paragons of durability or defenders against rust. Yep, you know all that stuff, you’re a good group. What you might not know is that you can generally tell the Bertone cars (’82-’89) from their Fiat predecessors from a distance because they are mostly all two-toned. Out of the about 200K in total produced, the Bertone cars make up around 50,000. Did you know that? This one is an ’84 and like all the Bertone cars it sports a 75-horsepower 1500-cc SOHC four and a five-speed gearbox. Also like most all X1/9s you are likely to see up for sale, it’s a little rough around the edges. People who have really nice ones either tend to keep them or simply trade amongst other aficionados. The car rocks a somewhat unfortunate yellow over poop paint scheme, but at least it all looks reasonably shiny and the pin-striping at the border is only moderately eff’d up. There doesn’t seem to be any appreciable rust or signs of any major past damage on the car so it seems a sturdy base for whatever you want to do with it. Wheels are factory alloys, but all are uniform in missing their center caps. Also, the front airdam looks to be missing a piece so there’s some hunting to do with this car. The interior needs some attention too. The driver’s seat is torn in the squab, and the sun visors have gone all puffy as they do. Some switches are missing in the console and the car comes with that weird beer-tap shifter for the five-speed that someone in Italy thought would be a hysterical joke but somehow made it to production.. Still, the seller says it runs and drives, and it comes with a clean title so it will most likely get you home. The fuel injected four looks complete and without evidence of any tomfoolery. Here’s where it gets weird—and why I mentioned the guns earlier: the seller says he’s asking $3,500 for the car, or the trade of “rye fulls piss tolls or a truck.” Now, I admit to not being the sharpest tool in the shed, and admittedly it took me a full minute to actually figure out what he meant by rye fulls piss tolls. I don’t know if the present political climate has driven him to decide it’s time to give up the X1/9 and take up arms either in support or suppression of the inevitable uprising yet to come, or maybe he just likes guns. Either way, we deal with cash here, not carbines so we’ll have to decide if that $3,500 price tag makes this X1/9 a winner. What do you think, should this tidy mini-Ferrari go for so much? Or, is this Bertone priced to blow it? For $13,900, Could This 1989 BMW 325IX Touring Be Your Holy Grail? For $5,000, Is This Fiat Bravissimo?